I have a high honor in life to be married to a Vietnam Veteran. Lou and I value FREEDOM, which of course comes at a great price, making it the most precious and costly gift we can receive. I have experienced these freedoms both physically and in my spiritual journey with God. My father is also a Veteran, as are many in my husband’s family. We are members and very supportive of both organizations for Vets: American Legion and Veterans of Foreign Wars (VFW) clubs are places of relaxation and friendship for those who served in the past and are actively serving, as well as for their spouses. 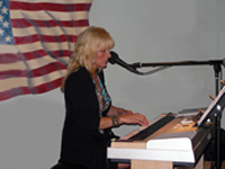 I have been providing entertainment for Veteran’s Organizations at a generous discount. Many organizations use my entertainment services to help raise funds for their particular post, or for a specific project. It is often helpful to provide a meal prior to the show, which always improves attendance. I welcome these opportunities and am happy to support such organizations. For bookings and availability, complete the contact form. We will respond within 48 hours. Hi Denise: Met you tonite at Augie’s, thanks to Lou telling us about you at the swapmeet in Congress. Your music is powerful, beautiful, a pleasure to listen to. Just wanted to say, it was a pleasure to meet you.